A personal highlight of 2008 was discovering Farflung. 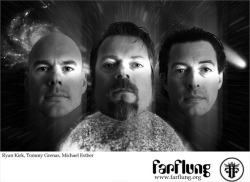 It a bit weird we've never listed any records by LA space rockers Farflung. They've been plugging away for almost 12 years, and A Wound In Eternity is in fact record number 12. At least one or two of us here have some old FF records in our collection, regardless, it's finally time to right this very wrong. Self proclaimed the heaviest and trippiest FF record yet, A Wound In Eternity is indeed both trippy and heavy, due possibly to the recent addition of various new members, their sound as always borrows heavily from Hawkwind, Monster Magnet, Kyuss, the usual heavies, but with their own distinct twist, and listening to this now, we're feeling a definite glam vibe, a bit of garagey-stomp, really catchy and hooky, but just the tone and the arrangement is sort of reminiscent of classic seventies glam, albeit super charged and a bit more drugged up and spaced out. Which is probably why we hear so much Monster Magnet in FF's sound, they have a similar over the top glamrock meets space metal crunch. No confirmation from Farflung or the venue. But if this is the real deal, I can say I accomplished something in 2009. Bordello is a beautiful and unexpected setting, and its location basically ensures there will be no noise complaints. You should be there. The Swords of Fatima stopped by to let us know that Farflung will be performing with them at their record release party at Bordello, although without guitarist Michael Esther. That's not enough to keep me away.